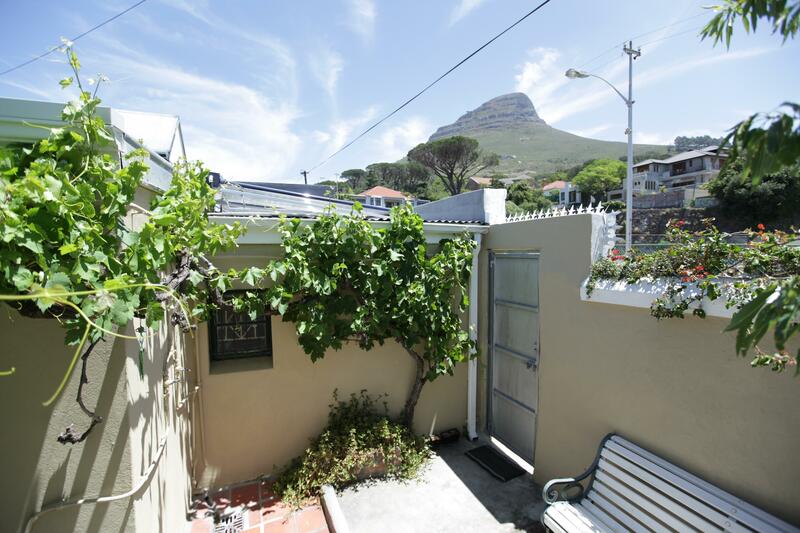 56 Kloof Nek Road is a two-bed roomed, semi-detached Victorian cottage, situated in Tamboerskloof, a suburb within the inner City of Cape Town. 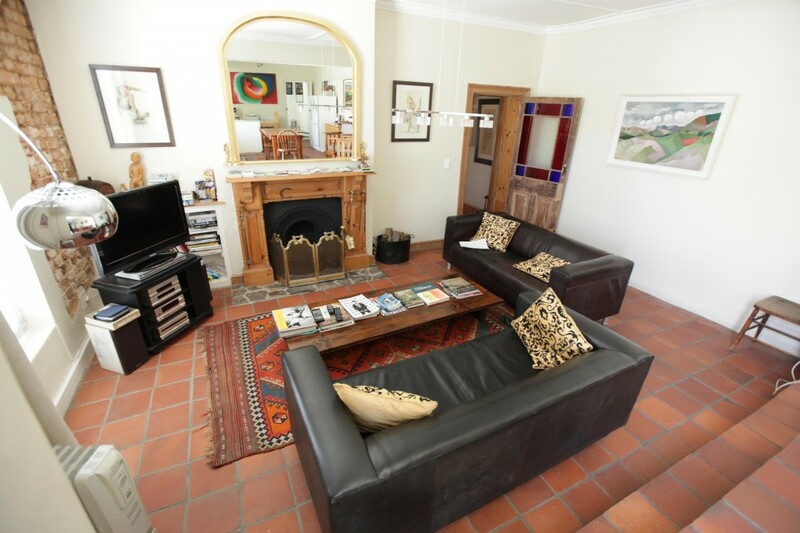 The area is considered to be one of Cape Town’s finest and is much sought after, as it is situated within easy walking distance of the City Centre, and is half-way between the City and the majestic Table Mountain on the one side, and Lions Head and Signal Hill on the other. Much of the area is rich in Victorian-styled houses and traditional architecture of the late 19th century. Tamboerskloof is considered to be a safe area, with excellent community safety services. The architectural style of “56” is Victorian, boasting high ceilings and plenty of original Oregon wood doors and floors. Built in 1875, the house celebrated its 130 birthday with an extensive renovation and refurbishment in 2005. 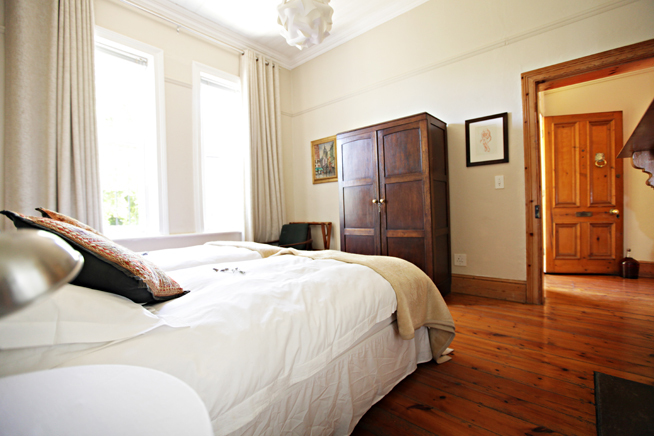 The cottage comprises one double and one twin room. All bed linen used is 100% pure cotton. 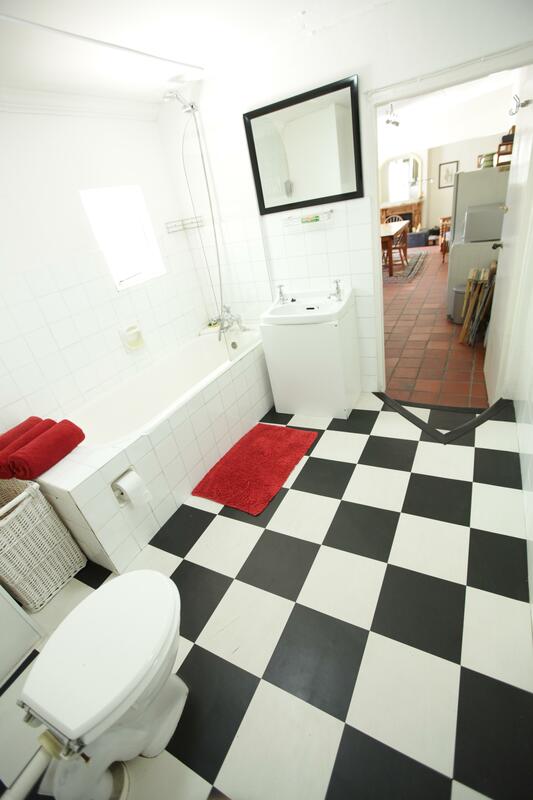 There is one full bathroom indoors, with bath and hand shower, and an outside shower situated under the large grape vine – very popular during Cape Town’s long hot summers. The remaining area consists of a huge living/dining area with an open plan kitchen. The living area is simply furnished with leather sofas, a large coffee table, antique Kelim carpets and a TV and music system. An eclectic selection of books is available, and a small private art collection adorns most walls in the house. The kitchen is fully equipped, and includes fridge, stove, toaster, dishwasher, microwave, washing machine, tumble drier, and all necessary cooking and eating utensils. A “Non Smoking” policy is applied indoors. The entire house is fitted with burglar bars on the windows, and burglar gates on the doors. 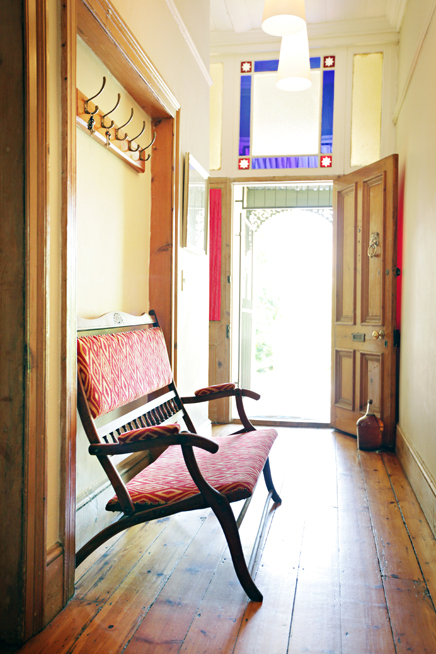 ”56” straddles two roads, being Kloof Nek Road in the front, and Leeukop Lane at the back. 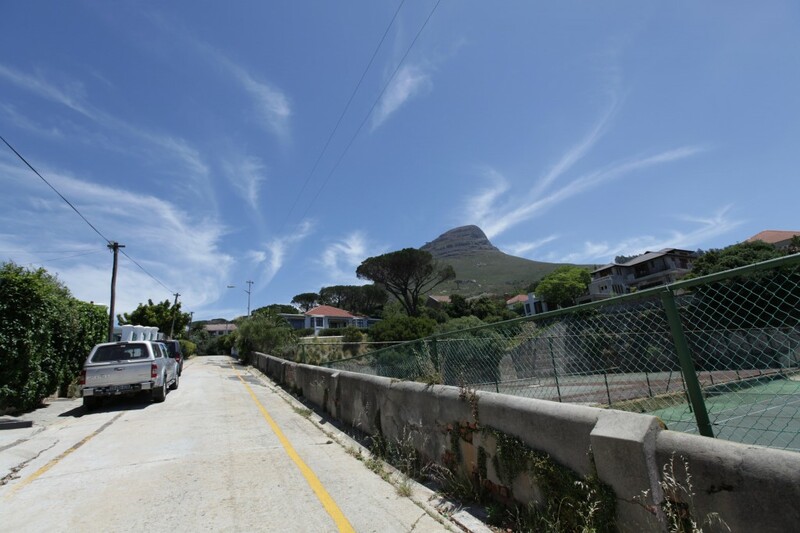 The former road links the City to the base station of the Table Mountain Cableway, and is also the main thoroughfare to Camps Bay, Clifton, and Hout Bay. Leeukop Lane runs past the back of the house, and is one of the two ways of convenient access to the house (the other being in Kloof Nek Road). A small convenience store stocking most essential household necessities is situated almost directly opposite the front door, and several tennis courts are to be found opposite the back door. Parking is on-street and is available, both at the front and at the back of the cottage. A safe and secluded back garden provides the ideal setting for enjoying barbecues under the old grape vine; for candlelit dinners; or indulging in some private sunbathing! 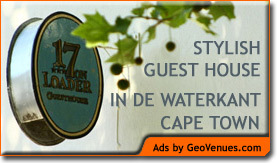 Situated next to 17 on Loader guest house in De Waterkant Villlage in Cape Town, 19 Loader Street is a charming self catering Edwardian house. Exquisitely decorated with antique furniture and plush upholstery, crystal chandeliers, and featuring some fabulous art, 19 Loader Street has been modelled on a stylish, classic European townhouse. The atmosphere in the house is relaxed yet opulent. There is a sense of comfort and old worldliness. The bookshelves are stacked with fabulous titles to choose from, old and new, classics and modern literature. There are three bedrooms in the house, 1 double downstairs and a twin and a double upstairs. Each room is individually decorated and every item of furniture has been thought about and placed with the greatest of care. Each of the bedrooms has its own bathroom, two en-suite and one separate, with bath and shower. 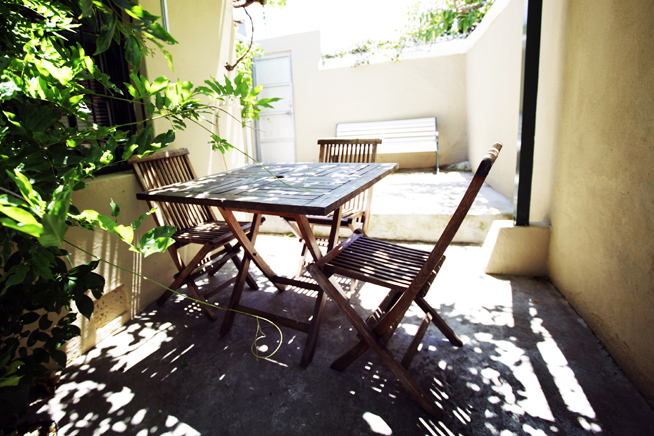 The two upstairs bedrooms share a balcony where guests can sit out and have breakfast or just relax and soak up the warm sun. The open plan living/dining area offers guests the perfect retreat from a busy day out and about, with comfort the top priority. There is an outside courtyard off the dining room where guests can enjoy the sun, in complete privacy. 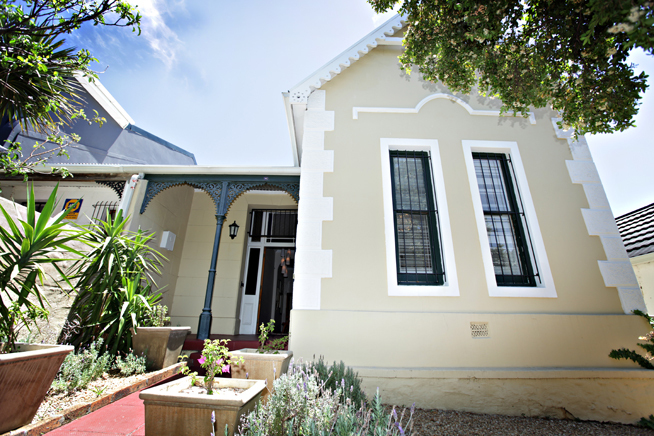 At the front of the house is patio, shaded by tall plane trees, that offers guests a bird eye view of Loader Street, one of the many charming little avenues that make up De Waterkant Village. De Waterkant Village is one of Cape Town’s gems. Situated in between the V & A Waterfront, Signal Hill and Bo-Kaap, this unique part of the city offers visitors a very different experience to the rest of Cape Town. Specialising in cafe lifestyle, De Waterkant Village is home to boutique stores, designer decor shops, fabulous art galleries, niche restaurants, cafes and delis. 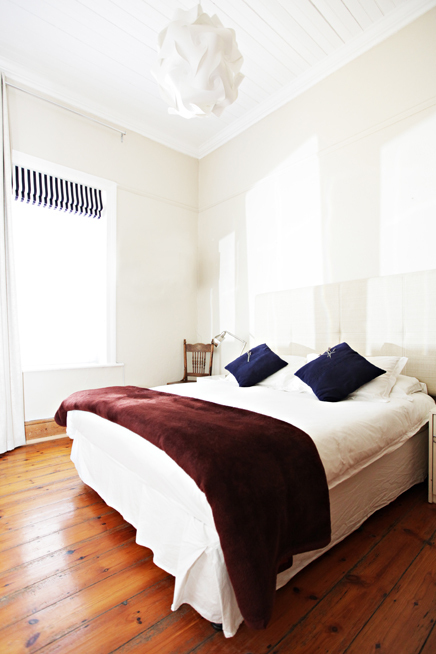 Safe to wander around, De Waterkant offers a villagey feel in the middle of the city. Close to some of the best shopping in the world at the V & A Waterfront, walking distance from Cape Town city centre, with a view of Table Mountain 19 Loader Street is ideally situated to be a base while visiting the Mother City.